We lost a great steward to the P-51 Mustang. William “Bill” Yoak of Lewisburg WV passed away on March 12 2013. Yoak had been battling cancer for several years. He was 67. Bill has been around warbirds and P-51s since an early age. He was a master sheet metal artist and learned the trade many years ago. He started out with a job at Lockheed where his stepfather was working. Yoak progressed and later obtained the highest clearance even working at the famed area 51. He was looking for more and started his own aircraft business. 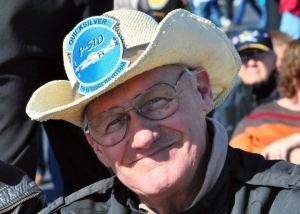 He was an accomplished pilot and began to gravitate towards warbirds. He eventually flew almost every type of single engined fighter. Yoak’s sheet metal work, flying skills and passion for moving forward opened some doors in film work. Bill flew for the famed series “Baa Baa Black Sheep” and also performed helicopter work in “Blue Thunder” and “Rambo III” among other film and TV work. While working on Rambo III in Israel, Yoak acquired some WWII P-51 parts from a friend he had made. He brought the pieces back to the US. Around 1994 he began a long journey rebuilding his P-51. Having all the skills necessary, all he needed was time, money and parts. Many years later, in April 2007, Bill Yoak took his creation on its maiden flight. The P-51 he named “Quicksilver” had some very unique features. The first thing you notice is the paint work. Bill and his wife decided to create a special tribute to all veterans. They used an experimental type of sparkling paint that was difficult to use and took may attempts to get right. But, they succeeded and when the sun catches the paint, you see countless little starts that represent a veteran who fought for our freedom. Bill, who did not serve in the military, had a passion to say thanks to those that did. Bill’s son Scott “Scooter” leaned to fly early and became a P-51 pilot at age 19. He worked and honed his skills to obtain a low-level aerobatic waiver in the P-51. He displays the beautiful bird at airshows and gatherings. Bill was a great source of P-51 survivor history. He worked on several P-51s and knew so many people involved in warbirds. Bill Yoak will be missed. He will be remembered as a skilled pilot and craftsman who always shared his talents and knowledge with others. He opened the cockpit of Quicksilver for anyone to climb in and enjoy.